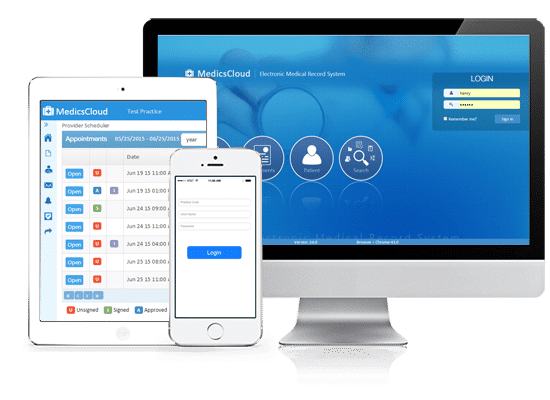 The Medics Suite is a browser-based, mobile-friendly, secure integrated EHR and PM system that will keep you connected, yet set you free at the same time! Revolutionize your transcription eﬀort with the Medics Suite for Orthopedics and its built-in Medics FlowText! At the same time, Medics FlowText enables the EHR to be highly voice-command navigable, greatly reducing if not completely eliminating the user’s need to touch a keypad or mouse. Cases: This clearly delineates a patient’s different cases, which is typically an area of concern for the Orthopedics practice (e.g., the patient’s work injury is clearly separated from that patient’s skiing accident). Multiple Complaints: This provides numerous Orthopedic-specific encounters, with the ability to handle secondary complaints…a highly important need for Orthopedics. Digital Imaging: Provides the ability to store the patient’s images directly as part of their record for easy viewing and retrieval. Images can be notated-on through the system’s built-in handwriting capability. The Medics Suite represents a highly comprehensive array of capabilities designed to propel your Orthopedics practice or healthcare organization into the next realm of possibilities with an ultra-stylized, sleek look. It’s fast and responsive, and because it’s in the cloud, accessible securely from anywhere with an internet connection.